As busy parents it is nice to get some time to relax and unwind every now and again. We were recently invited along to Down Hall Hotel for the weekend to road test the hotel and spa facilities. Down Hall is set in an area of outstanding beauty; surrounded by 110 acres of Hertfordshire Park land and woodland. As we drove through the gates and up the long sweeping drive that houses a lake, trees & wildlife we realised that we had arrived somewhere very private, very relaxing and very special. At the top of the sweeping driveway we were greeted by a grand & impressive historical mansion. The building itself dates back 1322 and and its use as Hatfield Broad Oak Priory. In 1540 it was sold by Henry VIII to Williams Glastock who was responsible for giving the house its Tudor appearance. Since then it has a variety of owners and uses; including being used as a school! There are some really informative little booklets in the reception area with a full detailed description of the history of Down Hall; we both really enjoyed reading and digesting it and feeling the history that surrounded us. Down Hall provides a hotel experience like no other. Check in was swift & the reception staff were extremely friendly. We were given a room on the first floor. We had a double room, which had recently been refurbished to an extremely high standard. The room had a table & chairs, a desk, a wall mounted TV, an alarm clock with iPod dock and it also had a USB charger built into the wall which I thought was a great touch. The bathroom was up a small flight of stairs which made it feel all the more luxurious. 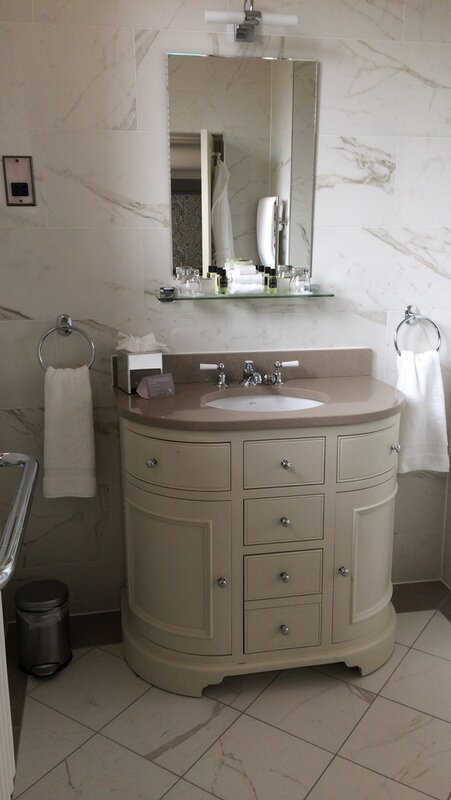 The bathroom had also been recently renovated to an exceptional standard. We also received free complimentary set of Gilchrist & Soames bath products which were amazing. We slept incredibly well in the room, there was a wedding on at the hotel the night we stayed and we did not hear any noise from it at all. The bed was extremely comfortable and we both had a wonderful night of sleep. Down Hall has a brand new, state of the art Eden Spa with treatment rooms, a tennis court, fitness centre, extensive grounds with nature trails, outdoor games, a restaurant, bar & conference rooms. We both used the spa during our stay; we had a three hour session in the spa area which has been recently refurbished to a very high standard. The spa area contains a hydrotherapy pool, steam room, sauna, and a relaxation room. There is also a small garden area with sun loungers; unfortunately we were not able to use the garden as it was raining. I felt that the garden lacked a focal point and would benefit from the addition of a hot tub or small water feature. We both really enjoyed our massages at the spa. I booked an aromatherapy massage and it was very very relaxing and honestly one of the best massages I’ve ever had. My therapist started the massage off by asking me to smell different oils on my wrist and choosing one which I preferred. The therapist then placed some of the oil I had chosen in hot water to infused the room with the smell. The therapist then went through some relaxation techniques before beginning the massage. During the massage the pressure was perfect and it was so relaxing. At the end of the massage the therapist guided me through a Chakra cleansing meditation and I had a really incredible experience; actually I felt like something was spinning at the end of my feet and when I discussed it with the therapist afterwards she said that it is something called a spinning wheel of energy. I’ve never experienced before and it really was quite special. We really loved the food at Down Hall. We had a 3 course dinner in the evening. I chose a soup followed by steak and chips and chocolate ice cream for dessert. The meal was divine and cooked to perfection. The steak literally melted in the mouth and the chips were the huge homemade Jenga style ones. The breakfast buffet was very good and had plenty of choice. The breakfast finished at 1030 which I thought was great as sometimes hotel breakfasts can finish a little early. There was both a hot and cold buffet; on the Continental side of things there was fresh croissants & pastries and hams & cheeses as well as fresh fruit, cereal and yoghurt. On the hot buffet was everything you needed for the perfect Full English breakfast. I had bacon, a fried egg (cooked to order), sausage, beans and hash browns. The breakfast was delicious and the sausages were amazing such a lovely flavour and really meaty. We had an amazing time at Down Hall, it was just the sort of stress free relaxing break that we needed as busy parents & I would highly recommend it.